This keyless remote programming instructions work for remote with part # 25602667, 68, 69 FCC id ABO0303T, ABO0302T and part # ABO91CH, 25550780 on the back of it. 1. Insert the key in ignition and leave in the OFF position. 2. 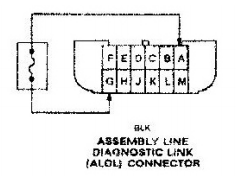 Locate the Data Link Connector (DLC) under driver’s side dashboard. Use the figure below to find the A and G pins. 3. Connect pins A and G of the DLC with a suitable electric wire. Receiver will respond by locking and unlocking doors within 2 seconds. 4. Press the UNLOCK button on the first remote to be programmed. Vehicle will respond by locking and unlocking the doors. 5. Press UNLOCK button on second remote to be programmed. Vehicle will respond by locking and unlocking the doors. 6. Disconnect jumper wire between pins A and G.